Home / Asia / International / product or service reviews / Travel and Living / Macau Hotel Reviews-Grand Lapa, Inn Hotel and Taipa Square! Macau Hotel Reviews-Grand Lapa, Inn Hotel and Taipa Square! During my Macau visit, I had planned a stay in 2 different hotels and thanks to flight delay by Air Asia, I got to stay in one more. All these are pretty standard hotels and my experience also has been normal, so I don’t have too much to write on them in separate posts, hence clubbing all three in one post. - Expensive hotels/resorts run a free shuttle service that keeps running from hotel to key spots such as border gate, airport, ferry terminal, Macao tower etc. Everyone are welcome to use these shuttles. Cheaper hotels do not run such shuttles but hotels that offer free shuttle are 2 to 3 times more expensive, so not worth selecting them purely for free shuttle. Though you are free to hop on any of these shuttles, it feels odd to board it with all the luggage when you’re staying somewhere else. However, wherever situation permits, use these free shuttle. - If you ask the hotel for cheapest way to reach hotel, they may not give city bus details. However most areas in Macau are covered by city buses and you can get information from Google maps or airport information counter and save big on your transport. City bus costs max 4.2 MOP per person, taxi can cost 50 MOP for 4-5kms. - All the hotels we stayed gave 2 key-cards, one each per guest. I have had inconvenient experience at many Indian hotels and resorts where they insist only 1 card can be issued per room. Our first stay in Macau- spent two nights here. When I mailed them on booking.com asking for cheapest way to reach hotel, they suggested taxi. At airport information counter I figured out that I can take Bus number AP1 to reach there. Wondering why Grand Lapa hesitated to share this information. 3 hour early check in was permitted as rooms were available. I was told I was given an upgrade- couldn't feel anything significantly extra in the room. I would have been happy with free breakfast. 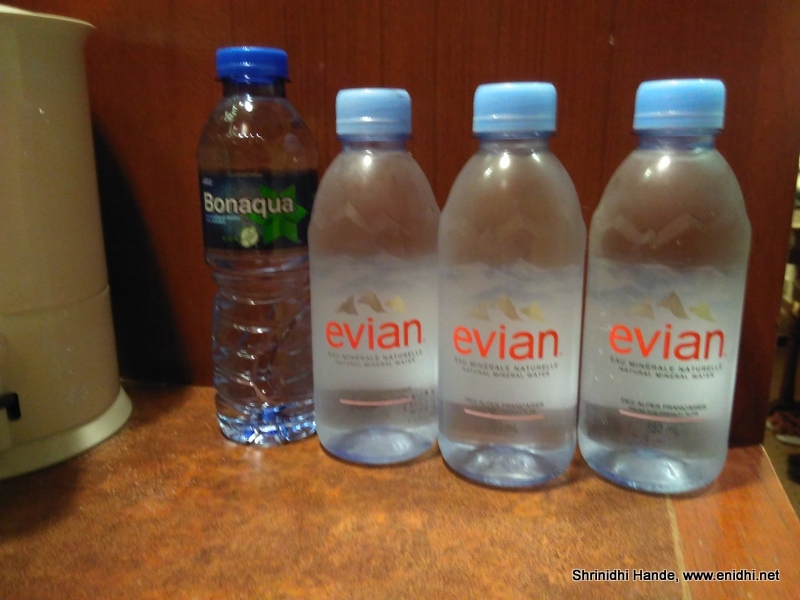 Two bottles of drinking water was free but I mistakenly consumed branded Evian drinking water instead of a cheap brand. They clean rooms 2-3 times a day and before I could realize my mistake and replace it with a bottle from supermarket, it was replaced by house keeping staff and I was billed. (MRP of that bottle is 10 MOP, Grand Lapa charges 40 MOP). With some discussion managed to get this waived off. We stayed in the tower. Grand Lapa also seemed to have a resort section. While check out they suggested we can use shuttle from Sands Resort, it felt odd and since ferry terminal was nearby, we walked. An Indian restaurant, The Taste of India is at a walkable distance from Grand Lapa and that was a blessing. Most of the popular attractions in Macau upper island- such as Macau tower, Ruin of St Paul, Guia Light house are within 2-3km radius from Grand Lapa. Border Gate, Airport, Panda Pavilion, Hac Sa beach etc will be far. Our stay costed 7k per night. While the stay was nice, I am not sure if it is worth 7k. Most decent hotels charge around 3k per night and for about 10k onwards, one may get a stay in luxury resorts like Venetian, Studio City etc. Grand Lapa falls in between- not budget, not ultra luxury. You may please decide for yourself if the compromise is worth. Our second hotel in Macau, where we checked in after returning from Hong Kong. Spent a night here. Check in time was 2 PM and when I sent them a msg asking if I can check in early, it was summarily denied. Not even a courtesy reply like "If someone checks out early we can facilitate early check in". We arrived at 11.30 AM, finished front desk formalities, kept bags at locker room and were asked to come back by 2.30 PM. Went to Panda pavilion, Hac Sa beach and came back by 3PM- room was ready, on 18th floor- the highest. But the view was blocked by other apartment buildings. Inn Hotel Macau has a heritage looking front covering modern towers. I accidentally broke a glass cup in bathroom. When I reported it I was only charged MOP 20 (about INR 170), which I felt reasonable. I was fearing what if they extorted me for MRP of the glass plus various other components star hotels often add- like MOP 40 for a MOP 10 water bottle in Grand Lapa. 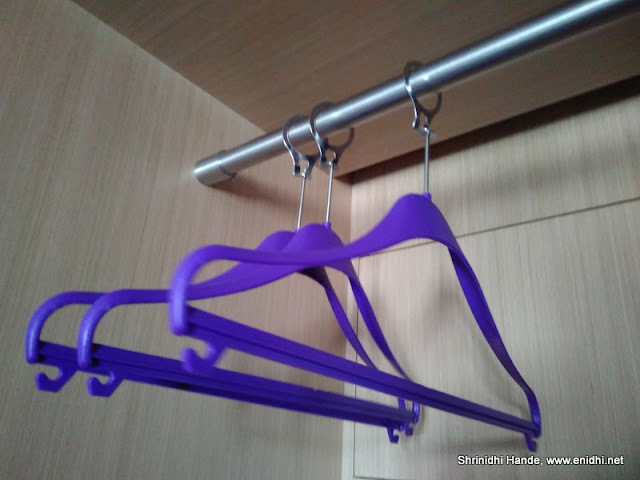 Hangers had a unique design- a bit inconvenient to use- to prevent theft. Couldn't find any Indian restaurant within walking distance- nearest was in Venentian Level 3, some 2.5 kms away. But supermarkets that sell fruits, snacks, donuts etc are within walkable distance. Breakfast here at Inn Hotel Macau was 70 MOP, one third that of Grand Lapa. Inn Hotel Macau does have a pool and gym but didn't have time to check it out. Stay costed about 4K per night. Well connected to various spots by public transport. You can consider Inn Hotel Macau for budget stay. 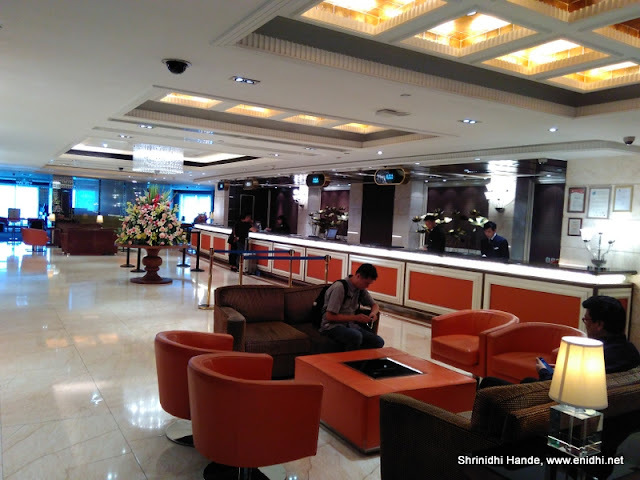 While all hotels will have lobby/reception at ground floor and suits on top most floor, Hotel Taipa Square has its reception on the top most 21st floor. So we need to go to top, check in and come down to our respective floors. (And reverse during check out) First few floors are as usual for casino. Got to spend a night here because of Air Asia’s flight delay. Rooms are pretty standard- guessing we were given cheapest rooms possible. Room was a bit smaller than Inn Hotel Macau and the view from my room was as below. 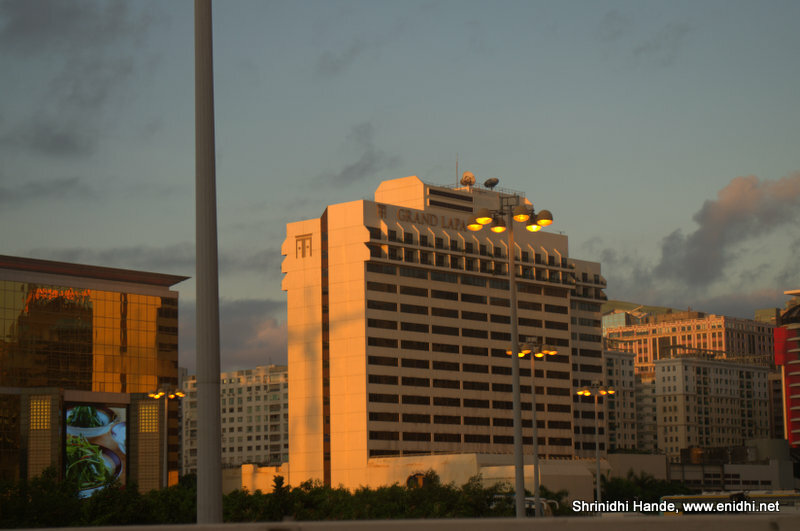 Rooms on the other side will have a view of Galaxy Macau. While other hotels kept normal coffee powder, milk n sugar, Taipa Square had white coffee (no need to add sugar and milk)- I think it is a plus point. Break-fast at Taipa Square costs about 60 MOP. Indian Garden restaurant is within 5 min walk from Taipa Square. Another family who stayed with us went there at 11 PM, owner was about to leave and he re-opened the restaurant and served them good food. A shop that sells and serves tender coconut is also close by. Hotel Taipa Square does have a small pool (1.45 meters deep) and a small gym at level 4. Nothing great about them but just serves the purpose. I think it will be good idea to split your Macau stay in two parts and stay at Taipa for one part and across the bridge closer to Macau tower for another half. Download Google's offline map and you can cover most attractions by foot. Awesome review. I am going to stay in one of these the next time visiting this plce. Thanks for sharing..